How do health care professionals diagnose eye strain? What is the treatment for eye strain? What is the prognosis of eye strain? Is it possible to prevent eye strain? The term eye strain describes a group of symptoms which occur in some people after extended use of the eyes. Although eye strain can be uncomfortable, it does not lead to any eye damage. Extended computer use or inadequate or excessive lighting may cause eye strain, but there are no permanent consequences of this. other discomfort, but eye strain will not damage your eyes or change their anatomy. The medical term for eye strain is asthenopia. The symptoms of ocular fatigue, tired eyes, blurring, headaches, and occasionally doubling of the vision are brought on by concentrated use of the eyes for visual tasks. Some people, while concentrating on a visually intense task such as reading fine print, using the computer for hours at a time, or trying to see in the dark, unconsciously clench the muscles of their eyelids, face, temples, and jaws and develop discomfort or pain from overuse of those muscles. This may lead to a vicious cycle of tensing those muscles further and causing more distress. Other people attempting to do similar visual tasks may have no symptoms at all. Common precipitating factors for the onset of eye strain include extended use of a computer or video monitor, straining to see in very dim light, and exposure to extreme brightness or glare. Many people will blink less than normal when performing extended visual tasks. 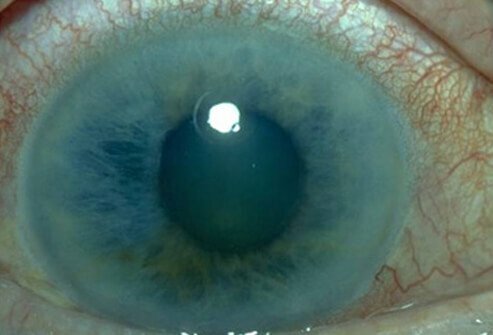 This decreased blinking may lead to dryness of the ocular surface and symptoms of dry eyes. Refractive errors (a need for glasses for distance or near vision, or both) may produce the symptoms of eye strain. The inability to make both eyes work together in a binocular fashion may also generate the symptoms of eye strain. However, most individuals who have limited or no binocular vision have no such symptoms. In people who already have headaches or blurring of vision due to eye strain, symptoms may be worsened by an underlying eye problem such as an eye muscle imbalance or a need for glasses for the correction of myopia, hyperopia, or astigmatism. Wearing glasses with an incorrect prescription may cause eye strain. In those who already have eye strain, not getting enough sleep, certain medications, being under stress, or being fatigued can also make those symptoms worse. If one asks patients who complain of eye strain to define what they mean by that term, they may describe nonspecific soreness of the eyes, mild tearing or dryness, blurring of vision, soreness of the back of the neck, doubling of vision, light sensitivity, difficulty focusing on images, tightness of the temples, forehead, brow area, or back of the head, or combinations of all of these. Headache is the most common symptom. It is usually mild, located in both temples, not pounding, and often relieved by stopping the visual task. The diagnosis of eye strain is made by a physician on the basis of the history as described by the patient and the absence of any serious eye disease. There are no specific tests to prove that the symptoms are indeed due to eye strain. There are no methods to objectively measure the degree of eye strain. You should see an ophthalmologist if you have ongoing pain in the eye, visual loss, redness, or irritation of the eyes. These symptoms cannot be explained by eye strain. In general, if your eye strain is not relieved by resting your eyes, an eye examination should be performed. If you are examined by your ophthalmologist for your symptoms of eye strain, he or she will do an examination, including checking to see if you need glasses. If the doctor feels glasses may make your eyes more comfortable, these will be prescribed. Symptoms of eye strain are unusual in children under 12 years of age. If your child complains of headaches after reading, eye fatigue, blurring of vision, or double vision, a visit to an ophthalmologist is warranted to rule out any underlying eye condition. Eye strain is diagnosed on the basis of the history that the patient provides and the absence of any serious eye disease. Eye strain is extremely common. As computer use has become commonplace, more people are experiencing what has been termed "computer vision syndrome," which is synonymous with eye strain. In most of these people, the symptoms are mild and they are aware that their feelings of the eyes being "tired" can be relieved by briefly closing their eyes and taking a break from the visual task they are performing. The symptoms will often be absent or markedly reduced on days when computer use is more limited. Although eye strain is uncomfortable, there are no long-term consequences of eye strain. There is no evidence that eye strain causes any adverse changes in the eyes. There is also no evidence that, in adults, continuing to do visual tasks while experiencing eye strain will result in any structural damage to the eyes. Eye strain, however, can be unpleasant and disruptive to your ability to concentrate and work. The symptoms of eye strain may lead to physical fatigue, decreased productivity, increased numbers of work errors, and anxiety. If you feel that you are experiencing eye strain after extended reading, try to adjust your lighting to maximize illumination while minimizing glare, take frequent brief breaks from the visual task, and consciously blink a few extra times. Firmly massaging the temples with your fingers in a rotary fashion for a minute while closing your eyes is often helpful in relieving the symptoms. If you experience eye strain while working at your computer, increasing the resolution of your screen (CRT) and reducing ambient lighting may be helpful. Adjusting the distance of your eyes from both the computer screen and your reading material may also relieve your symptoms. Changing brightness and contrast levels on your monitor and increasing text size can also be advantageous. Rather than keeping your eyes focused on the computer screen for hours at a time, interrupt this process every 15 minutes by briefly looking out of the window or around the room. When performing extended visual tasks of all sorts, occasionally stand up, move about and stretch your arms, legs, back, neck, and shoulders. If the symptoms of eye strain are predominantly those of dryness and increasing your blink frequency is not helpful, using an over-the-counter tear substitute a few times a day can be efficacious. If all these home treatments don't work to relieve your eye strain symptoms, see your ophthalmologist. The symptom of eye strain does not result in any damage to the eyes. Therefore, the prognosis is excellent. Relief of eye strain symptoms will usually occur using the above techniques. Once you recognize that your symptoms are caused by eye strain, you can usually modify the task that produces the eye strain sufficiently to reduce or eliminate the eye strain. Blehm, C., et al. "Computer Vision Syndrome: A Review." Survey of Ophthalmology 50.3 May 2005: 253-262. Wright, J., and W. Boger. "Visual Complaints From Healthy Children." Survey of Ophthalmology 44.2 Sept. 1999: 113-121. What are the signs and symptoms associated with your eye strain? Sharp eyesight is part of good health. Improve vision by eating well and scheduling regular eye exams with your ophthalmologist or optometrist. Certain medical conditions, like diabetes and high blood pressure, can negatively affect vision.